One way to bring natural light into a dark room is to install a tubular skylight. 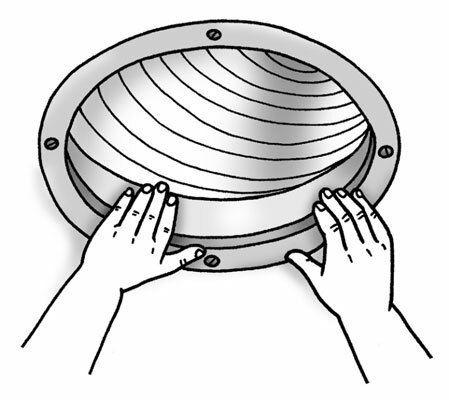 Installing a tubular skylight involves working on the roof, cutting an opening and weather-sealing around the dome, cutting another hole in the ceiling, and assembling and connecting the components. 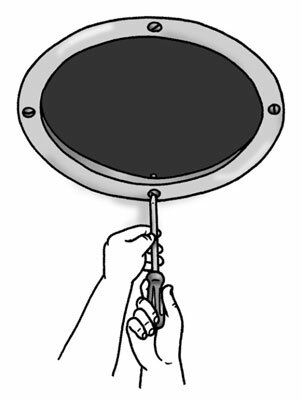 The following instructions are for installing a typical 10- to 14-inch-diameter tubular skylight. This size fits between the framing and doesn’t require cutting into the floor joists or roof rafters with 16-inch on-center framing. For other situations, refer to specific directions provided with the unit. 1Either tap the ceiling or use a stud finder to locate the stud. The location for the interior diffuser end of the skylight assembly, should not be directly below wood framing. 2Drive a nail or drill a small hole through the ceiling, stick a piece of wire up through the hole, and find the wire in the attic. If the wire isn’t directly between the ceiling joists, you must relocate the hole. The tube must be placed between the ceiling joists to provide adequate clearance. 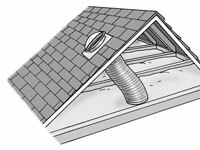 Clear away any insulation in the attic, and adjust the position of the hole if necessary. 3While you're in the attic, look for the most direct route for the skylight roof dome, which usually should not exceed 10 feet from diffuser to dome. Remember that a shorter, straighter tube runs work better, and if you have a choice, always pick a southern location for the dome for maximum light. 4Make a small hole through the roof, centered between two rafters, to mark the location for the dome, and insert a wire to help you find the spot when you go outside. The round skylight captures natural light through a roof dome and directs the light into the room through a reflective tunnel with a diffuser that spreads sunlight around the room. Many units come with an electric light so they can function as a ceiling light at night, and others combine an electric light with a vent fan. 5Use the diffuser frame or template, if one is provided by the manufacturer, to mark your cut line on the ceiling. Make sure that the template or frame is centered over the locator hole you made in the bathroom ceiling. 6Use a compass or drywall saw to cut inside the line and remove the section of ceiling. 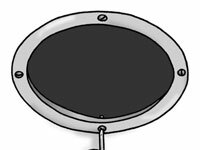 Don’t throw the ceiling section away; save it to use as a roof template. 7Install the bottom tube assembly into the hole. You can install the rest of the light tunnel from the attic side after you complete the roof dome cutout. 8Find the locator hole, position the drywall circle from the ceiling directly over it, and mark the shingles; then to cut out the circle. A razor knife makes the cutting easy. 9Cut through the roof decking inside the circle. 10Carefully pry up the nails of shingles immediately above and next to the hole. Slide the roof dome's flashing collar into place under the top and side shingles and over the bottom shingles. 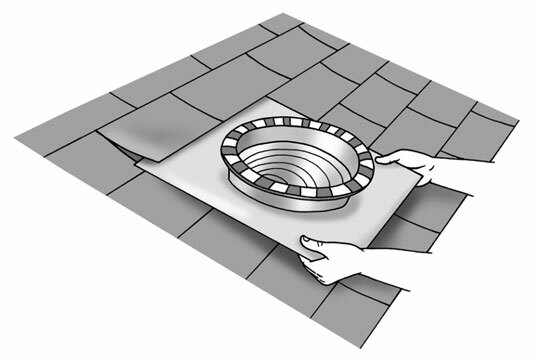 The roof must have an adequate pitch (more than 4 inches of vertical rise per horizontal foot) for proper drainage. 11Follow the manufacturer's directions for caulking and nailing the collar to the roof. 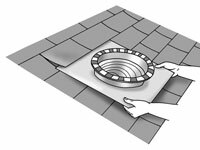 Optional flashing collars are available from the manufacturers for different types of roofs, such as Spanish tile or slate. 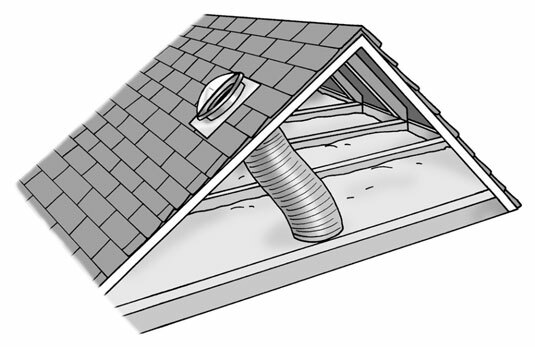 12In the attic, connect the tube or tunnel to the ceiling collar section, and extend it up to the roof opening. The ceiling opening doesn’t need to be directly below the roof opening because the tunnel is adjustable. Some units are designed with solid sectional tunnels that can be twisted into position, and others have flexible tubing that bends around obstacles. 13Cut it to fit, if necessary, and attach it to the roof dome collar. Use the manufacturer’s installation instructions to see how to fasten and secure the tube or tunnel. 14When you have connected the tube at the top and bottom, tape all joints and seams. Don’t forget to replace the insulation between the ceiling joists. 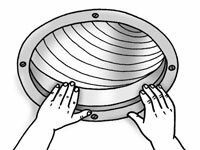 15In the bathroom, place the diffuser lens into the ceiling trim ring, and snap or clip the ring to the ceiling frame.